David Illustrates Stories Sure to Please! This page offers a number of books by David Gildersleeve that employ the same whimsical art style as used in his other works of art. They're fun to read and nothing like anything you can find by other authors/illustrators. Your kids will like them. YOU will like them! “A Number of Monsters” is a book that young kids will enjoy browsing through again and again. Whether they read it themselves, or they follow along while mom or dad reads it to them, they will be captivated! It is also a fun and whimsical way for kids to learn their numbers … to count … without even knowing it’s a learning experience. Click for more information and to order. 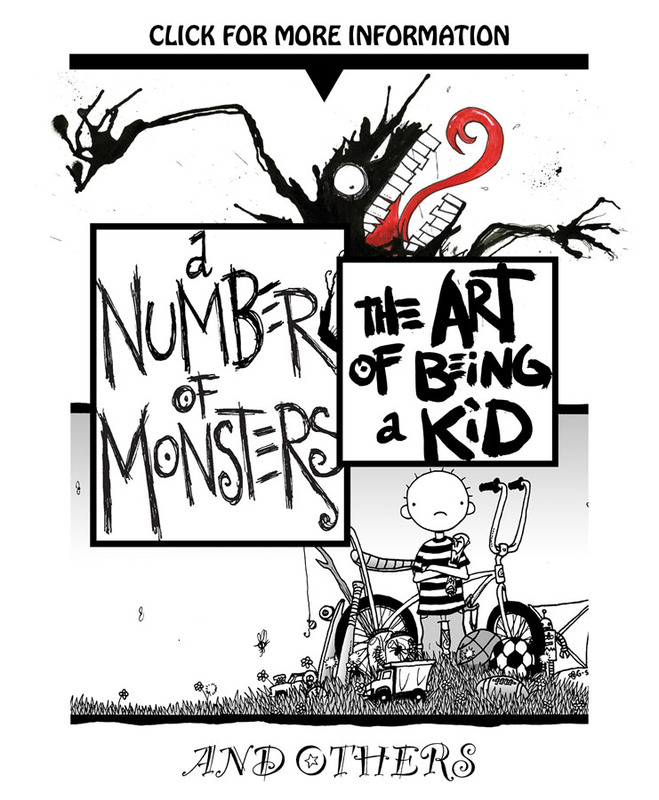 A book with a collection of 80 single-page illustrations that follow our hero through a year of being a kid — all the adventures and funny moments that prove we are all connected through the magic of being children. So get ready to be enchanted with this look into the life of a kid. It’s a great book for anyone with kids — or for anyone who enjoyed being a kid themselves: A walk down memory lane! Click for more information and to order. In this book, David's Dad comments on 20 of his favorite prints from the "Being a Kid" series of illustrations. Who would know the artist better than his Dad (other than, of course, his wife). We are all connected through the magic of being kids. Click for more information and to order. “Otto, The Guard Octopus” is a book for kids of all ages who enjoy a tale that is fun and exciting! It’s illustrated with page after page of imaginative art —a personal story about a boy overcoming his fears, written and illustrated by David Gildersleeve. Click for more information and to order.